Daily Illuminator: Munchkin Guest Artist Editions! August 10, 2015: Munchkin Guest Artist Editions! 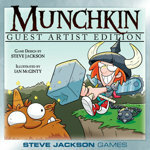 As part of next year's 15th anniversary celebrations for Munchkin, SJ Games is partnering with several talented artists to create Guest Artist Editions of several Deluxe-style Munchkin games . . . including some that have never been Deluxed before! (It is too a word. I'm an editor. Don't question me.) Our plan is for these to be special sets; once the first printing is gone, we'll take a look at sales and decide whether to reprint them. For general information, click over to the Guest Artist Edition web page. As we announce more of the sets over the next few months, the covers will appear on this page; when you click on a cover, it will take you to that product page. You can read the press release for more information about the Guest Artist Editions in general. 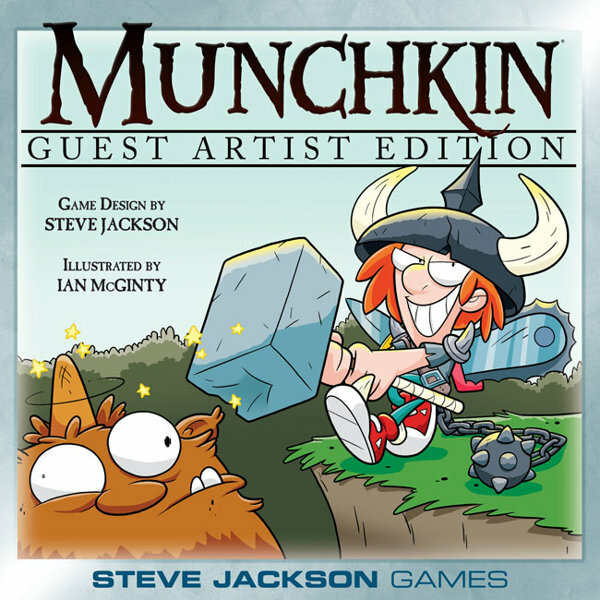 Munchkin Guest Artist Edition: illustrated by Ian McGinty. Those of you who have been reading the Munchkin comic from Boom have already seen Ian's work and know why he was an obvious choice to kick off our Guest Artist series. Star Munchkin Guest Artist Edition: illustrated by Len Peralta. You may know Len from his Geek a Week trading cards, his fantastic comic Ten State, or his illustration work on Munchkin The Guild. Len's good and fast, and we're very happy to be working with him again. Watch the Guest Artist Edition page (or the Daily Illuminator, of course!) for further announcements.